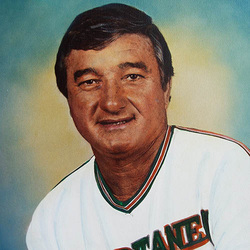 Known as the "Wizard of College Baseball" Ron Fraser coached the University of Miami baseball team for 30 glorious years, from 1963 through 1992, finishing with a career record of 1,271 wins, against 438 losses. Coach Fraser concluded his career as the third most winningest coach in NCAA history and was named NCAA Coach of the Year 4 times. He led the Hurricanes to National Championships in 1982, UM's first in baseball and the first national championship captured a Division tean in the state of Florida. He then captured the 1985 National Championship with a huge win over number 1 ranked Texas. During the early 1970's Fraser developed a friendship with George Light which forever changed the face of college baseball. Soon Mark Light Stadium was built and was considered the best college stadium in the country. From that time on colleges around the country copied the concept of Mark Light Stadium which changed college baseball facilities forever. His mastery of marketing college baseball helped develop the sport into a major player in college athletics. From his brainchild of having ESPN cover games in Miami, to his "Dinner on the Diamond", inventing batgirls with the introduction of The Sugarcanes, developing a mascot, The Miami Maniac, he made Mark Light Stadium THE family entertainment spot in South Florida. Coach Fraser coached UM to 20 straight NCAA Regional appearances and 12 College World Series appearances. In 1990 Coach Fraser was named "Coach of the Decade" for the 1980's by Collegiate Baseball Magazine. Fraser also enjoyed international uccess, leading the U.S. Team to a silver medal at the Pan American Games. He also served as head coach of the first Olympic team in 1992. Coach Fraser's uniform No. 1 was offically retired on April 24, 1993. He was inducted into the College Baseball Hall of Fame's Inaugural Induction class in 2006. Ron Fraser passed away quietly on January 20, 2013 at his home in Westin, Florida, surrounded by his lovely wife, Karen, daughters Cynthia, Lynda and Elizabeth, and his 5 grandchildren.